January 15th is National Hat Day and you may or may not know I am a fan of hats. One of my first posts for scrumdilly-do! 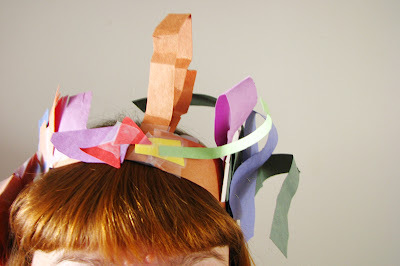 was in fact a hat post and in honor of the crafting spirit, this here little blog, and Hat Day (of course) for the next ten days I will bring you a nifty hat making project for you and your kiddos to get yer glue on! It has been my experience that a creative kiddo simply cannot refuse a dance or two with a tape dispenser. Hand them a tape dispenser and a pile of paper and if you are lucky, your kiddo will create for hours. Recently, while working with a young tot on paper tearing and tape placement we discovered how easy it was to create nifty paper band hats so get yourself some tape and scrap paper and get to it! Cut a band that will rest over your kiddo's noggin comfortably. Tape or staple into a loop. Hand your kiddo the tape dispenser and a pile of paper and let them go crazy! Cute! I like your blog.